In my last post (Carlos Lopez), I lamented how card maker Caruso picked green bunting for a 1976 bicentennial team set, when the situation obviously called for red. Ugh. It's only now that I realize: I'd forgotten about this post from 2013. Orange bunting and beige player. I also forgot this other post from 2013. Red bunting! But green player. Is Caruso never going to put all the pieces together for today's PCL team, starring Skip James? No, they will not. Red bunting and yellow player. Unlike the forthrightly patriotic 1976 Hostess, "red, white, and blue" never quite happened for Caruso. On behalf of America, I will accept it and move on. 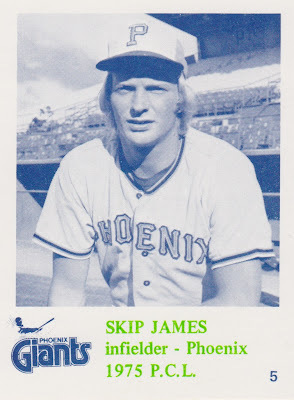 Skip served five years in the Phoenix heat and had already been a Giants 1975 type card. 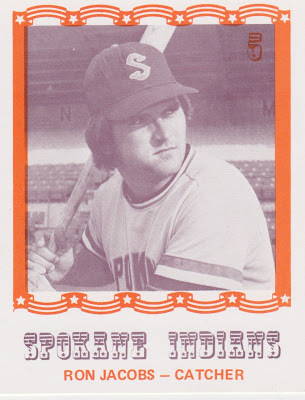 After two brief stints with SF, he emigrated to Japanese pro clubs in the 1980s, like a growing number of guys who couldn't find steady MLB work. I haven't heard if Pacific Coast players were more likely to try Japan than their Atlantic equivalents, but can see how it'd be easier to transfer fan interest overseas, given the larger Japanese communities in PCL cities. Value: This Caruso #5 cost $2 from MinorLeagueSingles.com, the source of many of my MiLB types. The team set includes a young Jack Clark and a few other future MLB players, so costs a little more than PCL sets with stars, about $20-25. 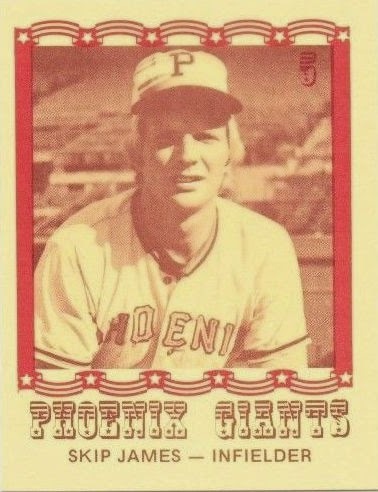 Fakes / reprints: Haven't seen any Caruso reprints in the marketplace, though it's possible Jack Clark's card got this treatment during his heyday.